When you have a child your priorities change. Just ask Penny McNamee who has traded Hollywood and New York success for a part in Home and Away. Some people might see Seven’s soapie as a step backwards after appearing in US dramas Elementary and Blue Bloods as well as US stage show Daddy Long Legs, but McNamee won’t have a bar of it. The 34-year-old, older sister of former Packed to the Rafters star Jessica McNamee, reckons her role as Tori Morgan is a “golden ticket” that makes her one of the luckiest actors in the industry. It even led to a Logie nomination for Best New Talent earlier this year. McNamee and financier husband Matt Tooker were married in 2009. The pair has a two-year-old son, Jack. “I’d been a working actor for 15 years and lived in New York and Los Angeles when this opportunity (Home and Away) came along,” McNamee says. “It (America) was fairly gruelling going in and out of auditions. After a period of time you value consistency (of work) and a beautiful city to live in. Those were the two biggest drawcards as an actor and mother and wife, added to the fact that my family and my husband’s family are in Sydney. McNamee certainly has plenty of meaty scenes to play with as Morgan who is a gun doctor at Summer Bay’s hospital. 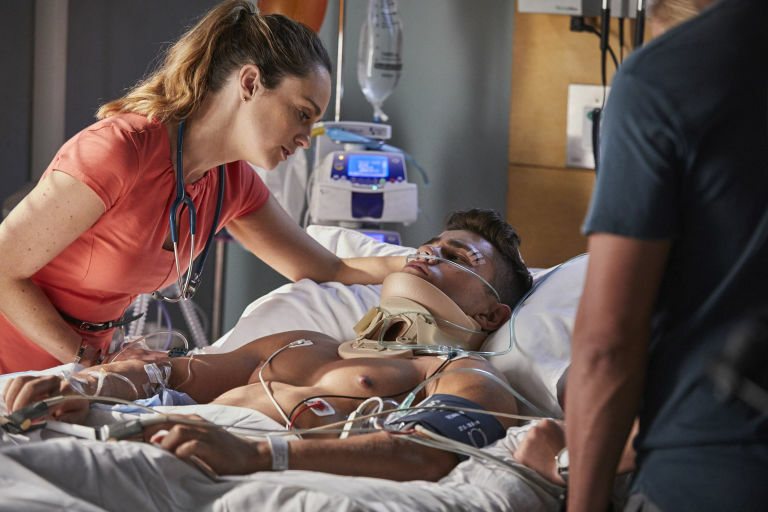 But Morgan is also dealing with brother Brody’s (Jackson Heywood) ice addiction and other brother Mason’s (Orpheus Pledger) coma after a horrific car accident. The accident happened because a juiced-up Brody thought that someone was chasing him and he turned the wheel to escape. “Tori is the mother hen of the family and a lot of responsibility falls to her,” McNamee says. “For several months she was very sympathetic to Brody — trying to help him and shower him with love thinking that was the way to pull him out of this (drug addiction). “That hasn’t worked so she is at the point where she realises she has to let him go — let him fail and hit rock bottom. He needs to crawl out of this mess himself. McNamee says that balancing the demands of Home and Away and motherhood can be tricky and that she and Tooker have had to make major adjustments to cope. “I really wanted to have a baby and it has been a beautiful thing watching my husband become a dad and we have had to restructure our life to suit,” McNamee says. “When I was pregnant and breastfeeding at home, Matt’s career was the priority but when I got this job he very selflessly said “we can’t both be going 100 per cent in our careers — one of us needs to be on call for Jack at all times. McNamee says that her theatre background, including daily performances as Nessa Rose in the Australian production of Wicked, helped her prepare for the rapid-fire pace of filming Home and Away. “I love the fast pace of Home and Away,” McNamee says. “I love pushing through scenes. When I work on films I get very frustrated at the amount of sitting around. “This job is really well suited to my personality. I’ve had very famous, critically acclaimed actors in Australia come up to me and say “you have the best gig in television”. “Actors know how valuable this gig is — because it gives you financial stability and you get an amazing profile from it because of the sheer number of people who watch it. Last edited by Pantherboy; 09-08-2017 at 00:01. Elsewhere, Kat's hysterics are the last thing on Tori's mind as she remains highly concerned for her brother's future. When Mason (Orpheus Pledger) is finally brought out of his coma, he responds well to his family but gets distressed when he can't feel his legs. The big question for the Morgan family is whether Mason will ever be able to walk again after the damage caused to his spine in the crash. Mason is distraught over his condition and begins to panic, but there is some good news when a doctor confirms that there is some feeling in his legs and he's likely to regain more as the swelling goes down. How long will Mason have to wait to make his recovery? Home and Away airs these scenes on Tuesday, September 12 at 1.15pm and 6pm on Channel 5. Elsewhere in Summer Bay, it's the moment that fans have been waiting for as Tori Morgan and Ash finally get together. 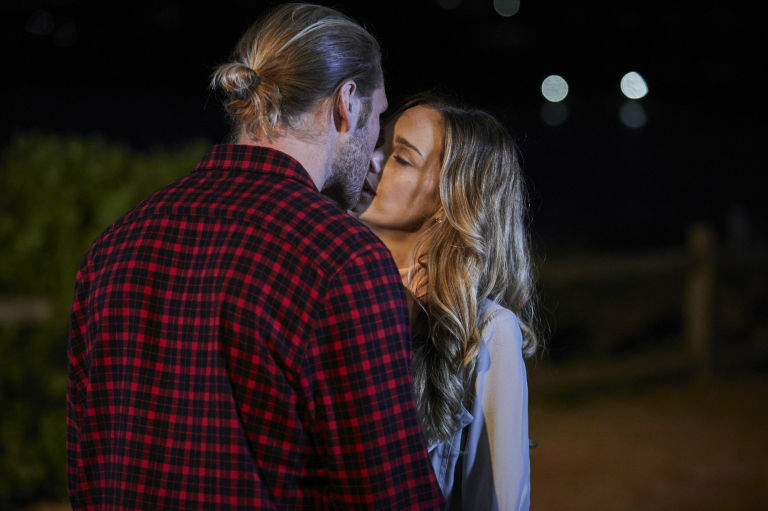 Tori (Penny McNamee) is given food for thought later this month when her brother Justin urges her to see that Ash's feelings for her are real, despite her recent fears otherwise. When stubborn Tori and Ash end up on dates with other people, Justin intervenes yet again – getting rid of the two other love interests to hurry things along. Left alone, Ash leans in to kiss Tori and although she pulls away in the moment, she later comes clean with Ash by admitting that she does want to be his girlfriend after all. With the truth out in the open, have this Summer Bay pair finally got their happy ending? Home and Away airs these scenes on Wednesday, October 25 at 1.15pm and 6pm on Channel 5.
is she next to fall for robbo, helping him why? Home And Away To Tackle IVF Storyline. Several weeks ago, BTTB exclusively teased an upcoming pregnancy storyline that could prove controversial. We can now reveal that mother-to-be in question is Tori Morgan (Penny McNamee), who decides that she wants to have a baby. Despite being single, she pushes on, enlisting the help of good friend, Robbo (Jake Ryan) to be the sperm donor. Viewers who keep up to date with spoilers will know that Robbo and Jasmine (Sam Frost) are still an item in scenes filmed just last week. For those not so up to date, we revealed earlier this year that Jasmine and Colby eventually break things off, and in a somewhat unexpected pairing, Jasmine later gets together with Robbo. How Jasmine reacts to the news of her close friend wanting to have a child with her boyfriend remains to be seen… But we have a feeling it won’t be pretty. Scenes shot today show real-life IVF and fertility expert, Dr Devora Lieberman, consulting Tori and Robbo in the hospital. These scenes are part of block 1400, slated to air the week commencing on 22nd October, however due to current erratic scheduling, this may change at a later date. Tori’s pregnancy comes hot on the heels of the news that her brother is also potentially set to become a father! The youngest Morgan brother is set to hook up with a new character named Dempsey, played by Sophie Don, resulting in Dempsey’s pregnancy. Whilst this development had already been confirmed to us by our sources, BTTB forum member Ludub also witnessed scenes being filmed at Palm Beach between the pair, with Mason seemingly pleading with Dempsey to not terminate the pregnancy. Home and Away airs at 7pm on Channel 7. Home and Away's Tori proposes a wild idea to Robbo, but will he say yes? Can Tori and Robbo stay on the same page? Home and Away's Tori Morgan faces a final decision over her baby plan with Robbo next week. The pair have decided to conceive a child together via IVF and co-parent as friends, but there are some last-minute doubts ahead due to Robbo's tragic backstory. Upcoming episodes see Tori (Penny McNamee) left disappointed when Robbo stubbornly refuses to open up over his traumatic past during an important IVF counselling session. Fearing that they've fallen at the first hurdle, Tori decides that Robbo (Jake Ryan) is nowhere near ready for such an important step and decides to wait on the sperm donor list instead. Tori regretfully shares her big news with her friend Leah Patterson-Baker (Ada Nicodemou) and brother Mason (Orpheus Pledger) early next week. Feeling that Tori is making a mountain out of a molehill, Mason angrily accuses her of being insensitive towards his feelings after his own heartbreak over Dempsey terminating her pregnancy. Later in the week, Jasmine Delaney reluctantly encourages Tori to give Robbo a proper chance to explain himself before making such a hasty decision. Taking this on board, Tori visits Robbo's apartment to hear him out, promising that she'll listen this time. When Robbo opens up fully about his past regrets over his deceased family and his desire to be a great father to their baby, Tori does another u-turn and they vow to go ahead with the IVF after all. Can they make this work? Home and Away airs these scenes on Monday, October 22 at 1.15pm and 6pm on Channel 5. Penny McNamee (Tori) announced a little while back that she was pregnant, after having fertility struggles. This article says that she is due in March next year, which would make her around 4 months at the moment?? She and husband, Matt Tooker, 36, are expecting their second child in March next year...………..
Jake is taking a short break from Summer Bay, as he's landed a part in a major movie. The Sam Kelly directed flick, Savage, has been inspired by real-life stories of New Zealand's street gangs during the 1960's, 70's & 80's. Robbo fans needn't panic, though - he'll be back on screen next year." It will be interesting to see how this is all incorporated into the H&A IVF/Tori/Robbo/Jasmine storyline. Her character Tori Morgan is making IVF plans with Robbo. The doctor becomes the patient in Home And Away this week when poor Tori starts to feel decidedly unwell. Outside the Diner, Tori (Penny McNamee) and Robbo (Jake Ryan) are discussing their IVF plans when she's suddenly overcome by a dizzy spell. Unsteady on her feet, the local doc grabs Robbo's arm for support. Robbo questions if she's OK, but Tori steadies herself and carries on. Fans shouldn't be surprised that Tori is feeling under the weather. Since discovering her fertility issues, the Morgan sibling has been under intense pressure to fall pregnant via IVF. She also has to contend with Robbo's flourishing relationship with Jasmine (Sam Frost). She's determined not to let their pregnancy plans get in the way of her friend's love life. "Tori has had a tumultuous few weeks!" Penny, 35, tells TV WEEK. "But she encouraged Robbo to pursue his relationship with Jasmine. She has to remain hopeful it won't affect their plans to have a baby together." Of course, Tori isn't the only one concerned about the situation. Jasmine has had to listen to her boyfriend going on about babies and watched him dash away to attend doctor's appointments. She's never felt more out of the loop and can't seem to adjust to her new circumstance. Robbo, meanwhile, is juggling things to try to keep both women happy. As he comforts Tori on the pier, he questions whether they've made the right decision to have a child. Clearly, the stress is getting to them. Will he call it off? "This has been a new area to explore for Robbo," Jake, 35, says of his tough-guy character. "It's been a welcome challenge to find a softer, more human side to him." Later that night, a confused Robbo is pondering what to do about the baby situation when he receives a call from the hospital. Tori is unwell and has been rushed to the emergency department. Robbo races to the hospital to see his friend. Will Tori be OK? Home and Away airs Monday to Thursday, 7:30pm, on Channel Seven.